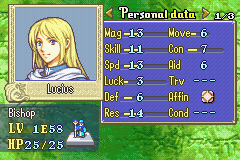 We start the next chapter and...wait a minute. The opening event is gone, but the prep screen isn't? How did I do that!? The Event Assembler did not exist when I made this. I'm impressed. I sucked so bad at hacking that I managed to impress myself. 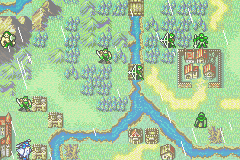 So, this is the normal Chapter 10 map...but with all the generic enemies replaced with generic allies. 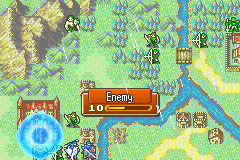 Except for the one Enemy. 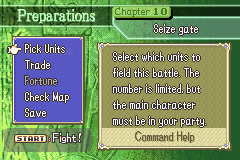 You know, I just have to ask: What WAS this chapter actually planned to be? Okay. So the idea behind this chapter... I think it was one of two things. 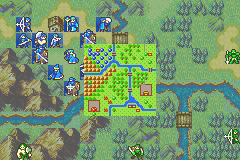 1) I wanted the player to feel like they were getting the upperhand, and everyone is allying together to fight towards one goal. 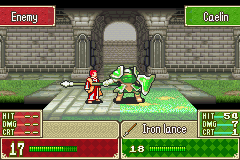 Defeating the boss. 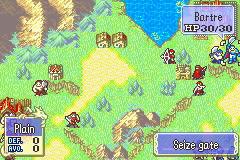 2) I wanted to show how powerful the final boss was by having him wipe out this entire army of NPCs. 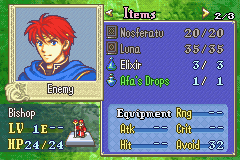 EVIL ELIWOOD! 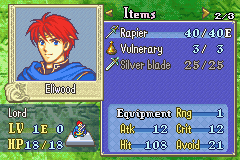 Or...just Eliwood, I don't really know. 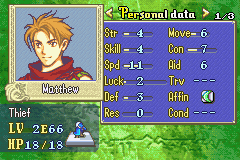 Makes me wonder if Marky intended for there to be an evil Lyn/Eliwood/Hector trio, but whatever this was planned to be, it didn't happen. 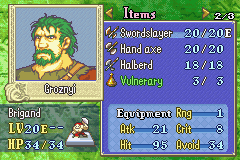 Oh, and he has no dark rank, so he can't even fight back against the green army out to get him. 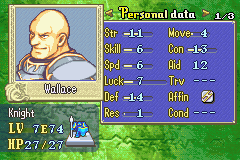 Okay, so this guy is supposed to be The Fooker. 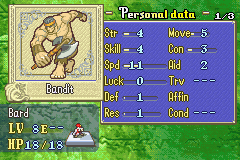 He used to be able to use his weapons, and he used to have way higher stats. 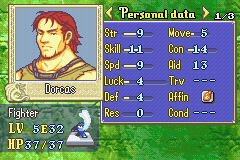 I have no idea what happened here, but I'm glad it did because he was ridiculously hard. 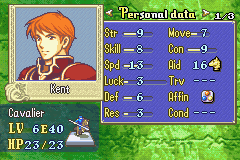 If your stats weren't high enough, you couldn't win. 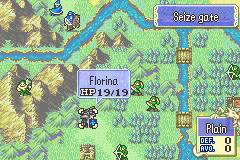 Florina's gonna ferry someone over to deal with Enemy. Unaltered stuff! 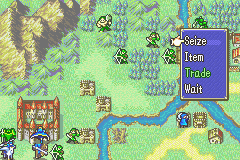 Anyways, Enemy doesn't get THAT MUCH regen from his throne, so it's only a matter of time until the green army takes care of him. See? 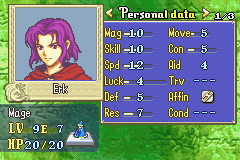 He had to rely on his elixir. 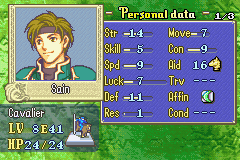 Now that Sain's there, he won't be hard to take care of. Wow, a great level at the very end. Nice. I checked, the armory/shop have nothing interesting. 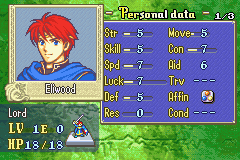 Again, because I'm curious, I'll start Eliwood mode too. 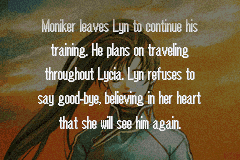 Yeah, bye loser Lyn, we'll be seeing you again in, well...just about every hack we're going to play except Chronicles of Lussaria. 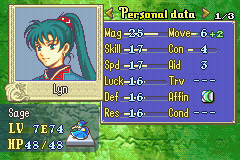 Lyn's battle statistics are the highest of all my units, and they still aren't that big. 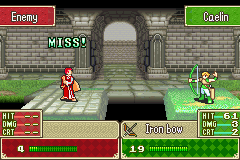 Man, Lyn's mode is lame. 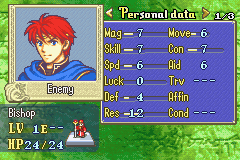 So, here is the start of Eliwood's map! Notice anything different? 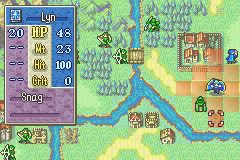 There isn't much, but the first thing is that...there's a generic lyn lord! 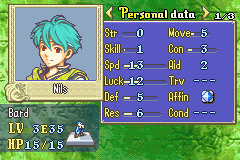 He has a Ninis's grace and...weapon ranks. I have NO IDEA. 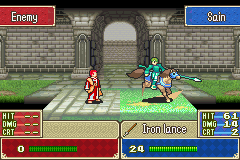 Eliwood is meh, with an awesome weapon he doesn't even come close to be being able to use. 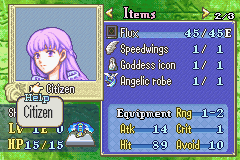 It's CITIZEN! Remember? From Chapter 1? ...No? Okay then. 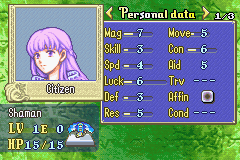 I really liked Sophia, so I made it a point to make her usable in the game. 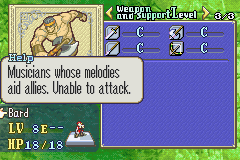 Her growths are very high in this hack. 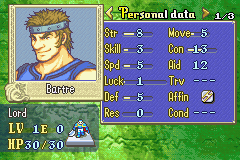 Bartre is a hector lord! So Marky, care to shed some light on that insanity? 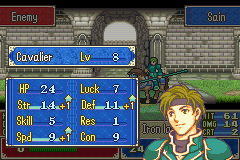 Anyways, that's all the changes I noticed, so...that's the end of Super Hard Lyn Mode! 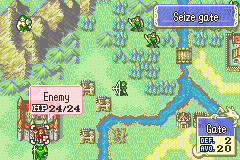 This hack at some point was going to go further. I used to have a version that went up to... chapter 13 I believe. 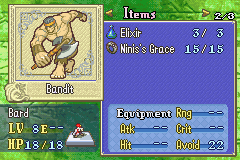 I very specifically remember the boss being a nomadic trooper with a bolting spell, complete with a "sword raise" animation to cast it. The changed characters you see here are more or less a blur to me. I don't remember why I made them like that, but chances are, it was because I wanted to make it different from the original. 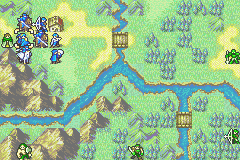 This hack is very much "of its time", being similar to hacks such as FE6: The Real War Chronicles by JadeWyvernRider, so the thought process you see in this hack can be seen in other hacks of its era (I recall quite a few hacks making Lyn or Eirika a mage). 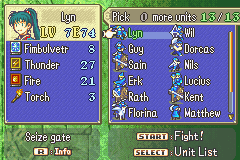 In fact, here's a fun fact for you, Super Hard Lyn Mode actually influenced some of the designs of FE6: The Real War Chronicles. 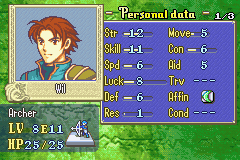 For example, that super powered villager in chapter 1 made an encore appearance in one of the versions of Real War Chronicles. It might still be there even. People that nobody cares about. 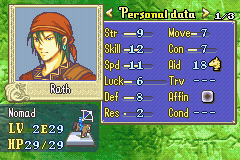 Yeah, I left our Normal!Rath and some other person, but NOBODY CARES. 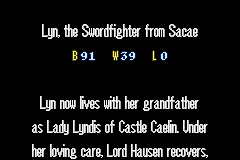 This is Lyn, after feeding her ONE ZILLION statboosters. She basically carried the team. 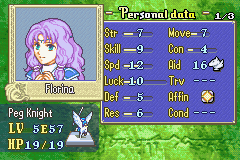 She might have been even better if I hadn't promoted her early, but things still worked fine anyways. This hack is bad. There's no denying it. 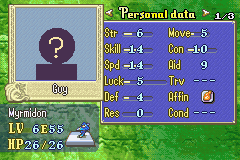 However, I will give it points for usually being bad in AN ENTERTAINING WAY. Most of the changes just felt like weirdness for weirdness' sake, although I'm really appreciating Markyjoe's "EXCLUSIVE CREATOR COMMENTARY", since it's revealing that there was, at some point, some tiny shred of method to a portion of this madness. 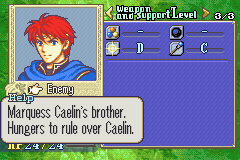 I'm sure you all just can't WAIT to see what he does when he makes his own not-reskin, and has to make his own maps! 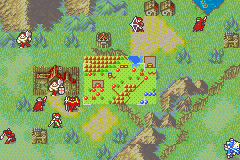 I think overall, this hack was me feeling out what I could do with the game's engine using the tools I had at the time, which mostly consisted of Nightmare, GBA Graphics Editor, and the OLD method of text editing, before FEditor Adv. It was never going to be anything fantastic. 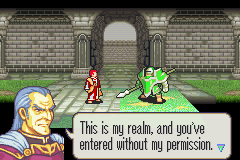 I mean, even when someone went all out on a reskin hack, such as MageKnight404, it didn't stand the test of time, and by todays standards - as unrealistically high as they are - the hack isn't looked upon favorably. 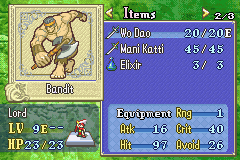 Reskin hacks just don't have much potential.